Folding is a bicycle part. This is a minimalist bike that answer additional needs: be transported easily without anyone on it. And the folding bike is justified if you make a part of your journey by train or car. For example you can park your car at the entrance of a city and end up cycling. 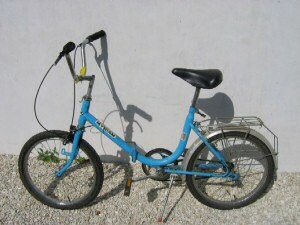 The folding bike is quite rare and often purchase must be new. An elementary cycle (low quality, single speed ...) will be little expensive (easily counted in 80 100 €). However, there are folding bikes very good that fold on several points, with a good range of speed and performance brakes. By cons prices can rise very quickly (up to € 1000 gently!). Choose a folding with wheels that you can easily find tires and inner tubes. Avoid too exotic dimensions! Your interview will be even easier. Finally, the folding bike is probably the only bike "urban" that is difficult to draw the portrait robot because there is a multitude of model without actually common frame at the equipment. Be careful in choosing and take your time: the best and the worst. The folding bike is hard to find at low prices. Always prefer models with features which you will easily find spare parts (brakes, tires ...).